2018 Men’s Hockey Champions Trophy will be the 37th and the last edition of the Hockey championship trophy for men. 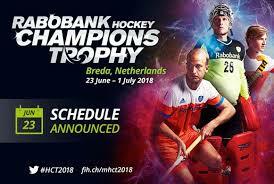 This big event of hockey is being managed from 23 June to 01 July 2018 in Breda, Netherlands. There are total 6 teams, which play this mega event of hockey and they are Netherlands (Host team), Argentina, Australia, India, Pakistan and Belgium. On the first day of the event, the opening match of the 2018 Men’s Hockey champion will be played between Pakistan v India on 23 June 2018. All of the teams will have to play at least one match against each team of the event. The classification matches will be played on 1 July in which the first match for the fifth and sixth position will be played at 11:30 local time and the third and fourth place mach will be started at 13:45 and the final of the event will be stated at 16:00 hours. Pakistan will play second match against Australia on 24 June, third match against Netherlands on 26 June, fourth match against Argentina on 28 June and fifth and last match against Belgium on 29 June 2018.